Is your catalog content scattered across different platforms? A product description here, a spreadsheet there, images filed in the cloud… It doesn’t take long before tracking your online product catalog becomes overwhelming. 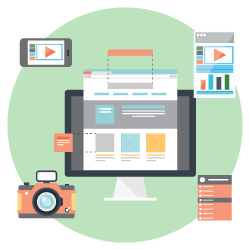 Each piece of content has a complex relationship with every other file format and product attribute. Every piece needs to be up to date and accessible to the right team members. Enter CrewMachine: e-commerce catalog management software. It collects, organizes and tracks your online catalog. Everything you need to create, publish and maintain an up-to-date catalog stays in one place. CrewMachine manages your e-commerce catalog for you. Created by and for e-commerce experts, CrewMachine combines industry-insider design with a customizable interface. Our experienced project managers walk you through setup, tailoring CrewMachine to your needs. The result is e-commerce catalog management that covers every product attribute you need and publishes across all your channels. A custom interface lets you focus on what’s important to your operation and ignore irrelevant details. CrewMachine makes our Fortune 500 clients’ lives easier with its unique solutions to the challenges of e-commerce catalog management. The product catalog is the backbone of any e-commerce business. It needs to be up to date and eye-catching with engaging copy and appealing images. Trust CrewMachine’s streamlined workflow to create and maintain your catalog. Express a unified brand vision and keep track of inventory with organized custom e-commerce catalog management. Gap analysis is like a personal detective that finds everything missing from your catalog: incomplete product descriptions, missing attributes, non-performing pages and more. CrewMachine searches your entire catalog to identify these gaps so you can prioritize underperforming content and optimize your catalog efficiently. 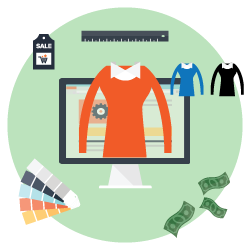 An e-commerce catalog is only as good as its ability to drive conversions. 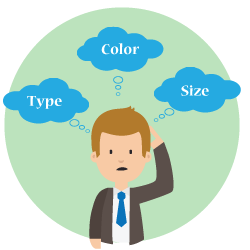 To be effective, you need product descriptions enriched with attributes. Each product description contains all the information, every description and every image your buyers use to make purchase decisions. It pays to get it right. Make sure you’ve covered all the vital pieces of the puzzle with CrewMachine’s attribute collection solution. Producing buying guides requires a lot of effort and is a challenge for small teams to build a library of buying guides and other long-form content. 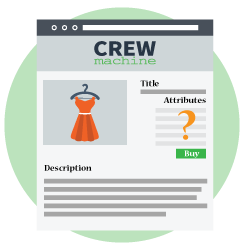 CrewMachine gives you all the tools you need to create effective buying guides at scale: keyword suggestions, multiple content formats to choose from and creative control tools.